It was midway through a particularly dizzy auto-rickshaw ride from dinner to our hotel in Bikaner that my mother flat out lost it. We were careening wildly along the road, a patchwork of curled dust spirals and potholes, the dirt road and pavement mixed together as though someone forgot to specify which kind of street they preferred. While dinner was gratifying — a thick masala paneer and mutton curry, shared between my mum and I with a side of the always-delicious jeera (cumin) rice — we risked losing it alongside our bumpy ride. 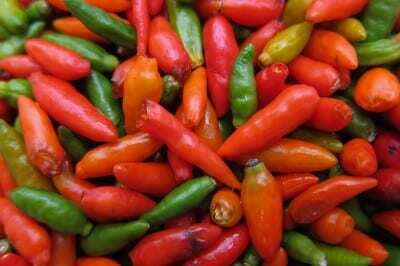 I put my hand over my mouth and burped unceremoniously, the paneer slowly creeping up my throat. 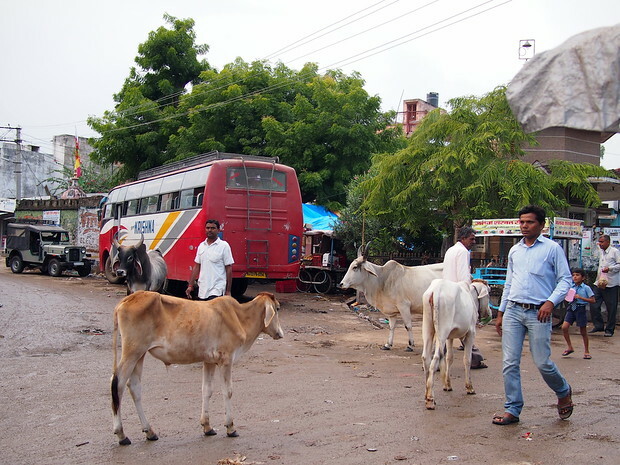 The auto-rickshaw swerved hard, curving around two huge cows and their calves that were lounging in the middle of the road. Nonplussed, one of the cows swatted its tail absentmindedly as we passed, her gaze already elsewhere by the time our ride righted itself once more. My mother began to giggle quietly. I hadn’t heard this giggle of hers for years, since my brother and I were kids. I remember the sound, prefaced by a quiet smirk that we knew meant things would unravel soon. First the giggle, then under-the-breath chuckling and then a full blown attack of laughter, contagious to all of us around her. I glanced over at her, concerned that she was actually upset. But no, her head was thrown back and tears were streaming down her face as she howled with mirth. 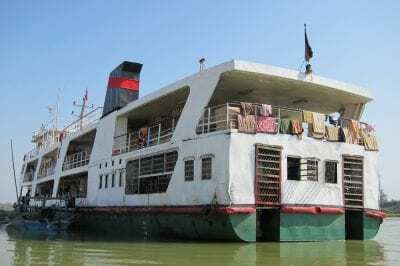 My gaze moved to our third passenger, Amy, whose eyes had widened in alarm. And my mum, finally able to control herself enough to speak, turned to us with a face full of tears. And with that she started laughing again, this time with both of us joining in. “Do you think if we lived here for awhile, we’d get used to the cows?” I asked Amy. 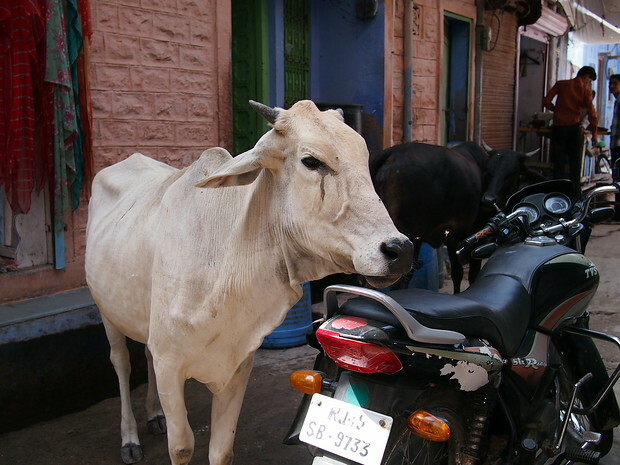 Looking outside at the side of the street, a tapestry of sitting and standing cows, of goats and garbage and bright saris, she rightfully responded without missing a beat. I suspect she’s right. I think of my months in Saigon and my glee with every last xe om ride I took, each yielding a new adventure and many laughs. I can’t see how the manic wonder would ever cease. There are always new cows to see. The man was leaning into his store’s narrow doorway, arms crossed, staring at us suspiciously. Manu, our guide, jerked his head up in response to the question and smiled. Narrowing his eyes at us, the man turned to Manu in confusion. 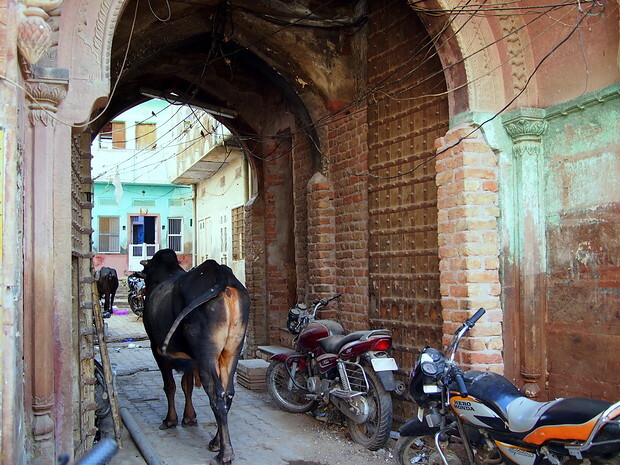 My mum and I were on a daytime wander through Bikaner with Amy, the rest of the group back at the hotel. 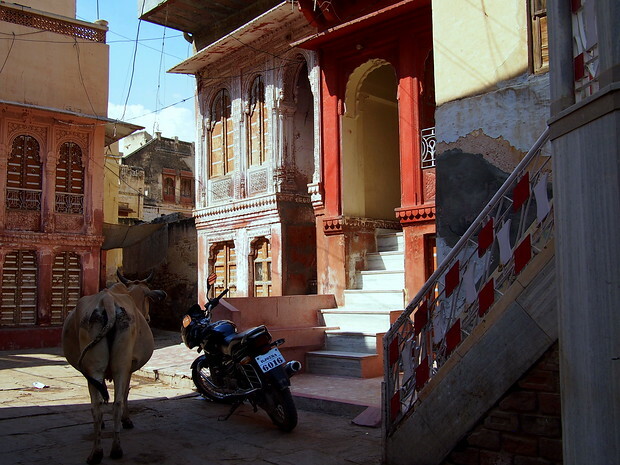 Transfixed by the narrow roads lined with red sandstone buildings and juxtaposition of cows and people, we were weaving our way through alleyways and doorways. 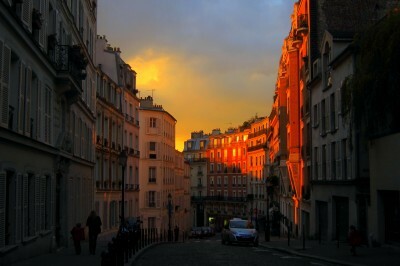 While on our way to the main market, we found a patch of buildings lit up by the afternoon sun, the walls glowing warmly. And, of course, a cow sitting in the middle of the scene. I didn’t tell him that we had done just that, moments before. 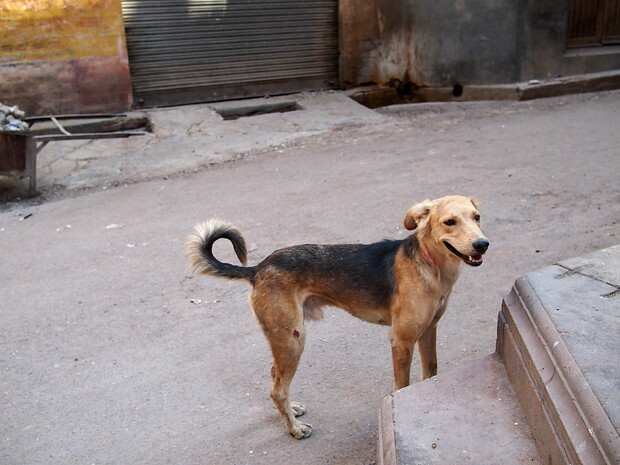 Bikaner dog smiling at us. 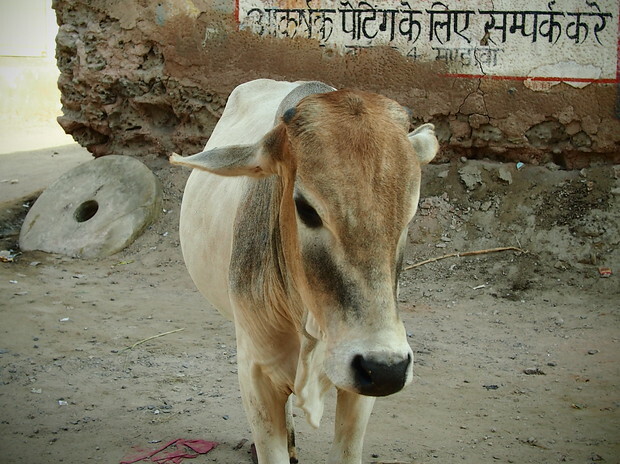 For those who have been to India, the prevalence of cows – and not just your every day cow, but a different type, an indifferent, generally blasé, “I’m just doing whatever I want, where I want” cow — is nothing new. For those like my mum, myself and Amy it was a non-stop bovine adventure. Nothing prepares you for what it is like to see so many of them draped around cars, standing on doorways, obstinately hanging out in the middle of a freeway with no regard to moving. Ever. 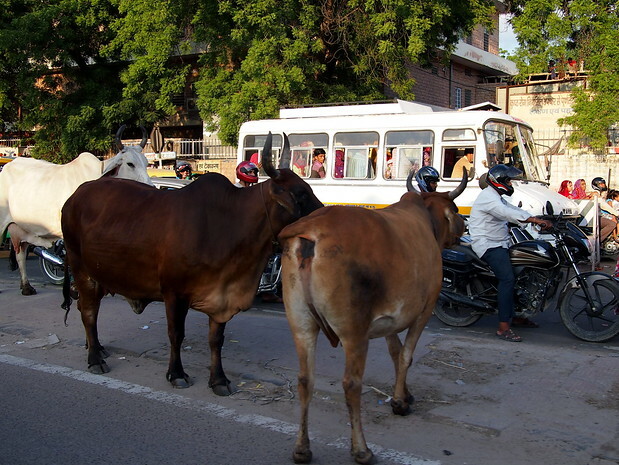 I realize, too, that cows are causing problems for traffic; I had several Indian people explain that understandably they were the cause of many accidents. 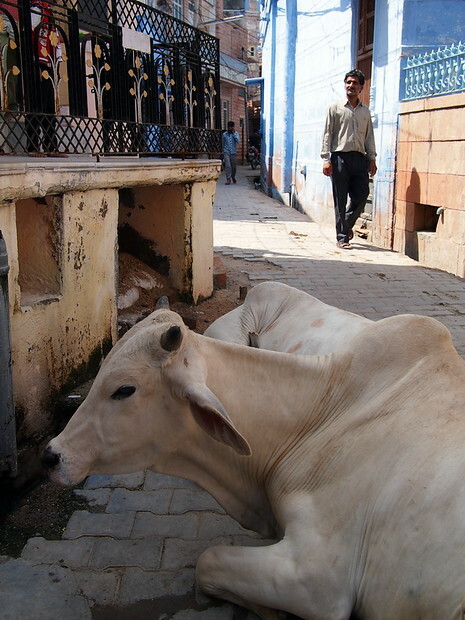 However, wandering around India truly felt like a cow photoshop extravaganza, where scenes of temples and ornate marble and curved stairways with wrought iron railings were drizzled with cows ex post facto. I realize that sounds ridiculous, but every time I thought we had reached Peak Cow Saturation, a few more cows entered the scene. 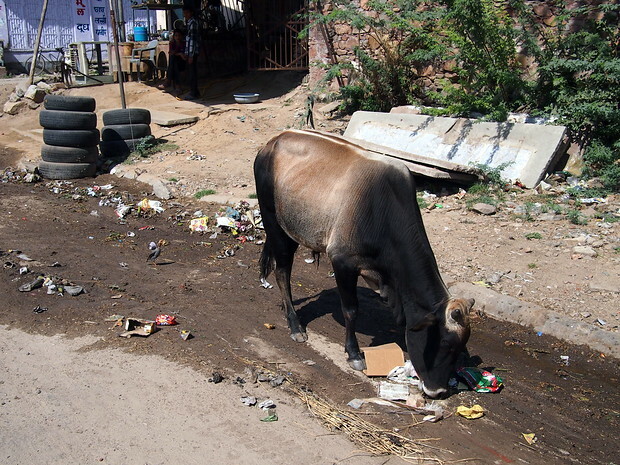 Jaipur wasn’t the cleanest, meaning that the cows ate the garbage too. 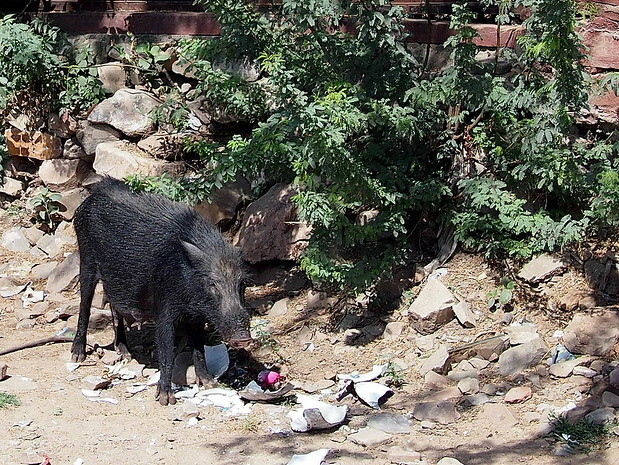 OMG IT’S A BOAR! Seriously, Manu told us they had these hair little boars and then we saw one and then I made everyone stop for my breathless boar photoshoot. BOARS! So cute. 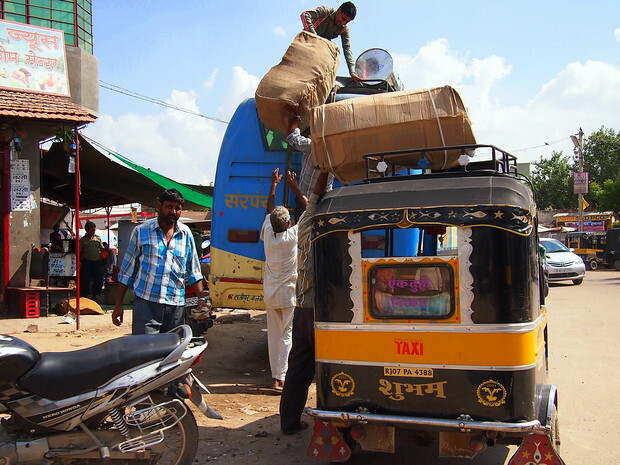 My view out of the bus window as the festival of Dussehra approached. Henna’d cows. This guy would NOT move. 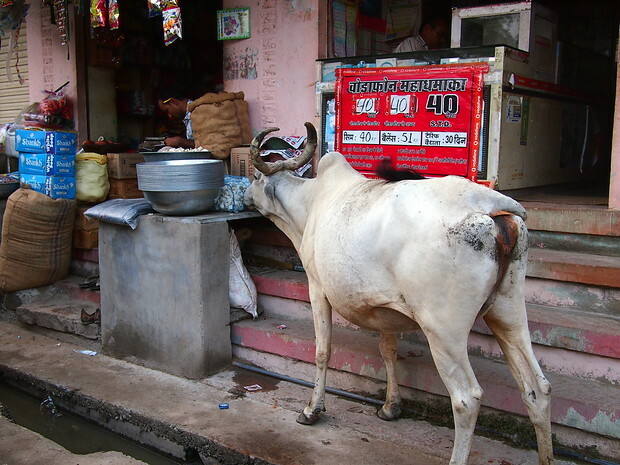 Store owner tried swatting him, moving the food, trying to move the cow. Nothing. He was adamant. Bus? Check. People? Check. Jeep? Check. Cows? MANY! Getting out of the way for an angry bovine? CHECK! Police officer? Check. Passerbys watching someone get a ticket? Check. Cows? CHECK! My favourite cow of all. Beautiful. And, ending on a calf note: what a cutie. Thus ends my cow extravaganza. 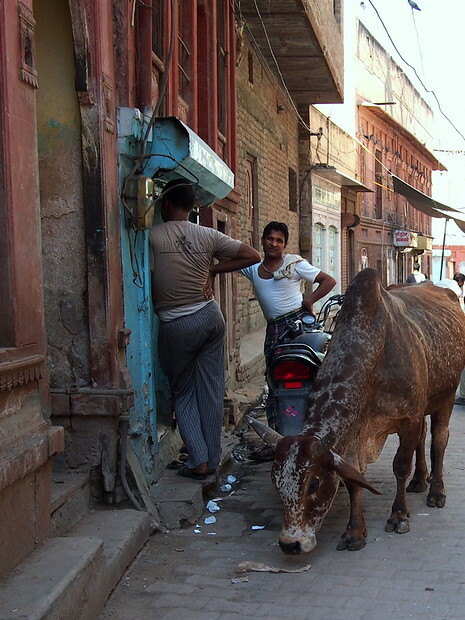 A short sample from the many cow photos in my repertoire from just a few short weeks in India. I’m currently in cold and snowy Montreal, waiting for my brother and his girlfriend to arrive this afternoon on their flight from the UK. We trekked back for the holidays to spend them with my dad, but unfortunately an ice storm has left him without power, and left the roads impassable to get to him. 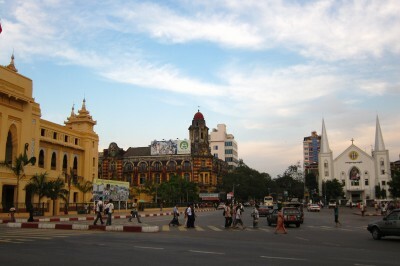 We are hoping that things will be cleared tomorrow — we are a mere 3 hours away, but unable to reach him and my stepmum. Crossing my fingers that power will be restored and the trees littering the road cleared. Happy holidays, whatever you are celebrating. As always, thank you for reading and here’s to a wonderful 2014 for everyone, full of family, friends and many delicious meals. Very entertaining. I heard about the cows like yourself and being from Ireland I am very used to cows but I can imagine the cows being on the road, in doorways takes a while to get used to. Love this! 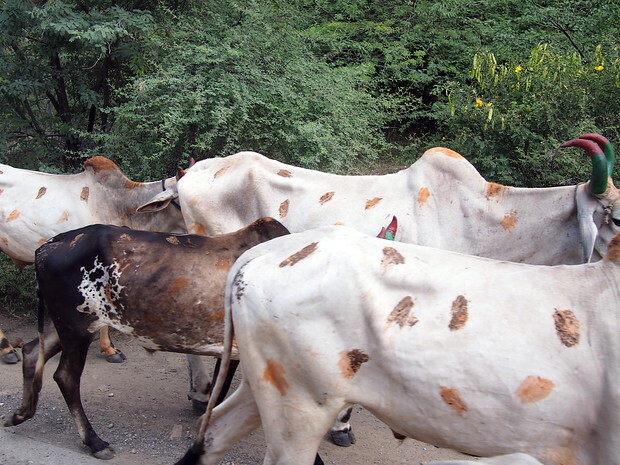 So many cows in India. 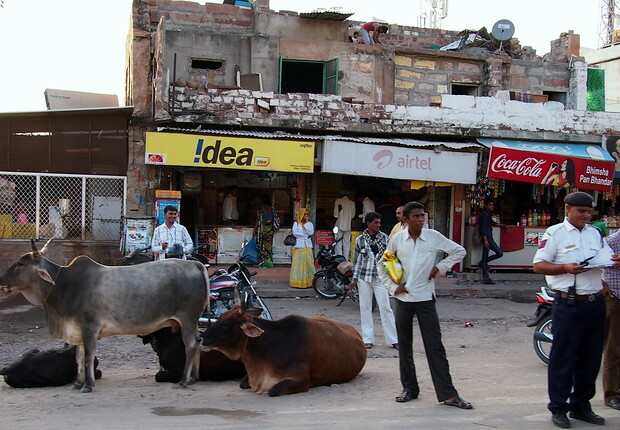 Our favorite cow moment was in Jaisalmer when a cow started walking up the steps into our hotel! When the manager saw that our way out was blocked by the cow he grabbed a few couch pillows and start smacking it around, in effect getting it go back down the stairs! Can’t say this is a problem for most hotels around the world! Thank God had a safe journey in, and out of that country. With all kinds of stuff happening in that country! Wow, you weren’t kidding! That black and white speckled cow really was gorgeous! 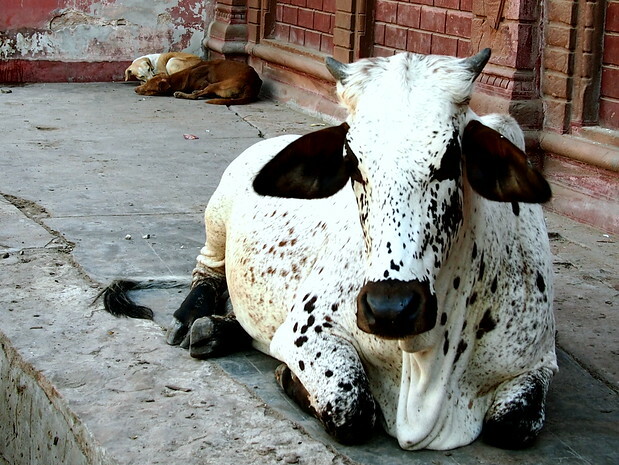 I’ve never seen a cow that looked like that before. Its nice to see your post. I am from India. 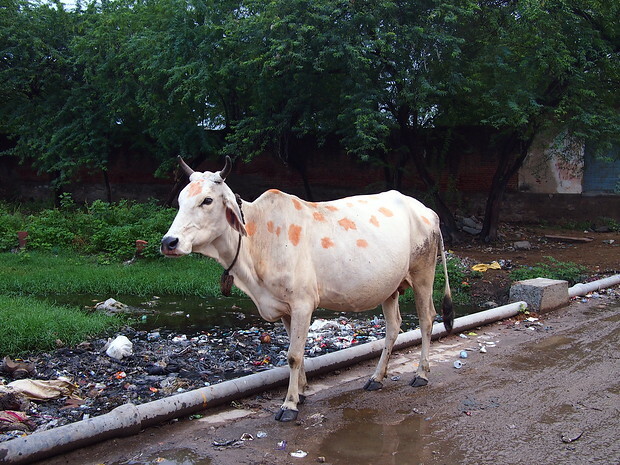 Sometimes I wonder why there are so many cows on our streets? 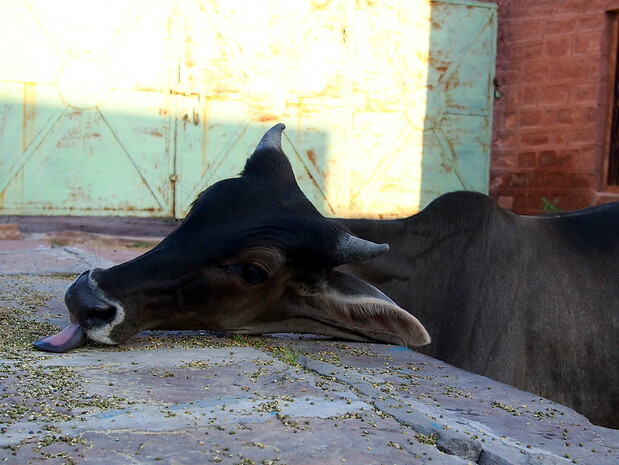 Is it because of our religious sentiments towards cows or is it because of our laziness? 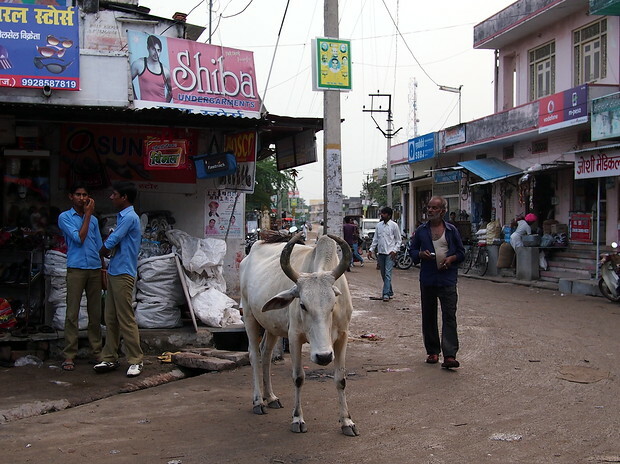 Yes, we do respect cows in India but it doesn’t mean we are ok with seeing them on streets. You know I feel jealous for you cause you have the best life style one can have. I love to travel but I can’t. The ad text in the background of the last picture with the calf translates to “Contact Us for Attractive Pictures”, seemed appropriate for a photo essay. Hi, I am from India and it was interesting to read this blog. I didn’t necessarily enjoy reading some part of it because the article revealed India in a poor taste, in some places – obviously not your fault. You were only trying to show what you saw. These are things that we need to keep in mind. Beautiful photos. That black and white girl is my favorite as well. Cheers.